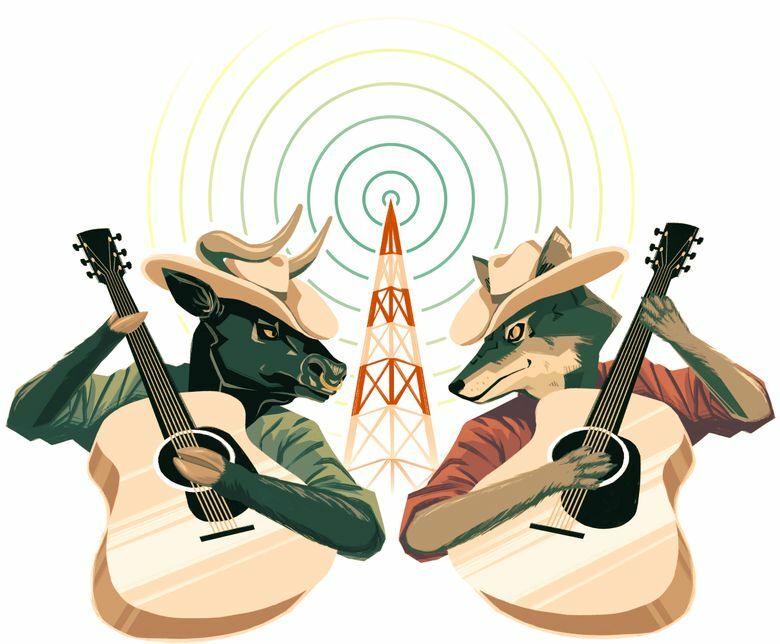 98.9 The Bull vs. 100.7 The Wolf: How do Seattle’s country radio stations stack up? One year after 98.9 FM's country makeover — and subsequent rebrand — we look at how Seattle-Tacoma's dueling country radio stations compare. Election season is over but Western Washington is still a battleground. Another showdown — one that cannot be won with red or blue lawn signs — wages on outside of Zac Brown Band concerts and during awards-show commercial breaks. Roughly one year ago, a shake-up on the local radio dials saw Seattle country bastion 94.1 KMPS go soft rock after 40 years of honky tonkin’. In its stead, a new, separately owned station emerged shortly after to challenge Western Washington’s reigning country leader, the more-than-a-decade-old 100.7 The Wolf, for the top spot in your car radio presets. Months after Rock 98.9 traded Soundgarden for Sam Hunt, the Hubbard Broadcasting-backed station had a slight reboot, rebranding its newly christened country station as 98.9 The Bull this spring, promising to play more new country than its fellow animal-themed rival. Twelve months and countless odes to cold beer later, we check in on how Seattle’s dueling country stations stack up ahead of their respective holiday bashes: The Wolf’s sold-out Hometown Holiday blowout at Accesso ShoWare Center on Dec. 6 and The Bull’s comparatively low-key party at Tacoma’s Steel Creek country bar the following night. If we’ve learned anything from our copious hours of listening, it’s that 7:15 a.m. is too early for Dan + Shay’s “Tequila” and that our regional country stations are as similar as they are different. An organization is only as cool as its mascot (take heed, future Seattle NHL team), so we’ll start here. Bulls are inherently country, evoking images of an angry bovine ready to be tamed by some 5 o’clock shadow in flatteringly tight Wranglers. Indeed, the wolf is a noble predator striking fear into the hearts of livestock owners. But you can’t drink beer while watching a guy named Rex with a groin of steel cheat death trying to ride it, so we’re calling this one for The Bull. One of the biggest gripes about commercial radio stations is playlist repetition, a criticism neither of Seattle’s country pillars can duck. With either station, expect to hear Bebe Rexha and Florida Georgia Line’s crossover megahit “Meant to Be” or [name any Jason Aldean song] enough times to question whether other country songs ever actually existed. Understandably, much of the modern country stations’ playlists overlap. But a tip of our Stetson to The Wolf for more readily throwing in the occasional “oldie” from stars of the past two decades, creating greater distance between Thomas Rhett’s latest and, say, hearing Chris Janson encourage mixing whiskey with Mountain Dew (the whiskey-mixin’ stops at Dr Pepper, Janson). The other usual thorn in the paw for would-be radio listeners, accentuated in the streaming era, is incessant commercials. Nothin’ kills the vibe after one of Midland’s smoky barroom anthems like a Home Depot spot (although we could use a new hedge trimmer…). The Bull came out of the gates boasting 12 more hours of music each week than The Wolf — a claim we did not independently verify, on account of having a life. Still, we won’t throw our challenge flag here, as the newcomer kicks out the hits at a respectable clip during its 55-minute “Bull runs” of uninterrupted tunes. While The Wolf claims longer 100-minute stretches without ads, their commercial breaks can be twice as long. Catch ’em coming up for bill-paying air during a quick trip to the store and you might as well hit seek. True to its more-music creed, The Bull’s a.m. crew offers a tad more rock than talk compared to its canis counterpart, though not for its hosts’ lack of chemistry (or zeal for plugging the station’s app and Facebook page). The Bull recruited its commendably energetic trio of Tim Leary, Claire Beverly and Karen “Red” Dais who had spent several years together in country-lovin’ Georgia. Meanwhile, the more laid-back morning shifters at 100.7 entertain with recurring bits like the voyeuristically fun Share Your Salary, where they try to guess how much a caller makes. In recent years, numerous reports and prominent artists have criticized country radio for the relative dearth of women receiving airplay. During Thanksgiving week, the most current info available, only two female artists cracked the top 30 on Billboard’s country songs chart: Maren Morris and pop-singer Bebe Rexha (thanks to that Florida Georgia Line feature). Our local stations aren’t exactly bucking the trend. Over one roughly 18-hour block on The Bull, only two different solo lead female artists — Maren Morris and Kelsea Ballerini — were played (several spins each) unaccompanied by their male peers. The Wolf fared only slightly better, playing five different such “stand-alone” women artists during a recent 13-hour run. To be fair, the numbers improve when including songs from mixed-gender groups or duets with men, though nowhere approaching a 50/50 split. Whichever station is right for you likely depends on what you’re looking for, though most mainstream country fans should find something to like at either spot on the dial. For a more concentrated blast of country’s current chart-toppers, try The Bull. Those craving a slightly more varied mix of the hottest singles and occasional favorite from an album cycle ago, embedded with sporadic country-era T-Swift nuggets or Tim McGraw heel-stompers of yore, may want to stick with the more senior Wolf, which has a little more mud on its tires. Good news is almost anytime you’re slogging down I-5 after work, there should be someone on Seattle airwaves singing about the cold beer that awaits you. 100.7 The Wolf’s Hometown Holiday 2018. Acoustic performances from Luke Combs, Maren Morris, Kelsea Ballerini, Brothers Osborne, Jordan Davis and special guest Mitchell Tenpenny. 8 p.m. Thursday, Dec. 6; Accesso ShoWare Center, 625 W. James St., Kent; sold out. Bull Nation Appreciation Concert. The Lowdown Drifters, Miller Campbell and Kaitie Wade perform. 7 p.m. Friday, Dec. 7; Steel Creek Tacoma, 1114 Broadway, Tacoma; two free tickets with donation of five canned food items; 989bull.com.